[wp_ad_camp_2]In our introduction to the stop whistle, we talked about the potentially negative nature of the stop whistle command. 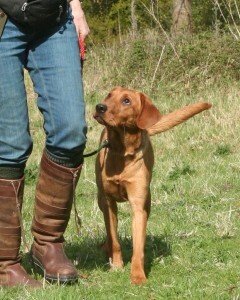 We also looked at different ways of rewarding the dog when he sits to the whistle. There is however, another way of giving the stop whistle a ‘feel good factor’. We can associate the sound of the whistle itself with a feeling of pleasure. Before you begin stop whistle training, it is worth getting into the habit of regularly associating your sit whistle with a pleasurable event. Pick events where the dog is already sitting. This helps to pair the whistle with the sitting position too. Our next step is to introduce the whistle as a ‘sit’ signal, and the best way to do this, is to pair the new signal with our old one. You will need to decide on how you are going to blow the whistle before you begin. Most of us use a single blast on the whistle ‘PEEEEP’ as a stop command. Blow fairly quietly when the dog is close to you and save a louder blast for when he is further away. Our old sit signal is the word ‘sit’, and what we need to do, is to precede the word ‘sit’ with the new whistle signal. Have the dog on a lead to begin this exercise. In this exercise, halting is the old sit signal, but use the verbal ‘SIT’ in addition to make it very clear to the dog what you expect. Spend a few sessions preceding every old sit signal with the new whistle. After a few sessions, begin to drop the old signal from time to time. and reward the dog profusely when he sits. As in the following exercise. What if he doesn’t sit? The first few times that you ‘omit’ your old verbal sit command, the dog may fail to sit on hearing the whistle. Wait a couple of seconds to give him a chance to figure it out and then, if he still fails to sit, give your verbal sit command. Continue pairing the old and the new commands a few times (Exercise 1) before trying again (Exercise 2). Failure to sit will happen less frequently as you practice. He will soon recognise that the whistle means sit, and be happy to comply. Practice as often as you can, you can use the sit whistle indoors too. Keep the whistle around your neck. Wait until the dog is standing up, then blow the whistle softly, and reward the sit. Use a verbal ‘back up’ SIT if he fails to respond, and reward each sit. Make these exercises very simple. The dog should be very close to you, calm, not moving around, and not distracted by other people, dogs etc. Remember to release the dog quite quickly after rewarding him. In the same way that SIT means ‘sit until I tell you to do something else’, the stop whistle means “sit/stop and don’t move until I say so”. Keep it simple, make it fun. Once the dog sits at heel (or under these other limited conditions) each time he hears the whistle and without you needing to add a verbal signal, you are ready to move on and introduce the next level of difficulty. Fade rewards before you do this! In the next post: Stop Whistle 2 we will look at adding movement to this exercise. We’ll be teaching the dog to drop into a sit position from a walk, and eventually from a run. If you are following along, let us know how you are getting on! Hi I have a 7 month old springer is he too old to start whistle training.? I love reading your article. We are a family of duck hunters and have had a few duck dogs over the years. Our previous( no passed on) dog was amazing in that she was just a natural at distance commands. Our new boy is almost 2 and while super willing and lots of drive just isn’t as natural at things. He isn’t a problem solver at all. He hunted last year and did well but we had an older experienced dog there. Your tips on the whistle stop have really helped me and Benni. He is now coming along nicely. Just wanted to say thanks and I will continue reading and recommending your page! 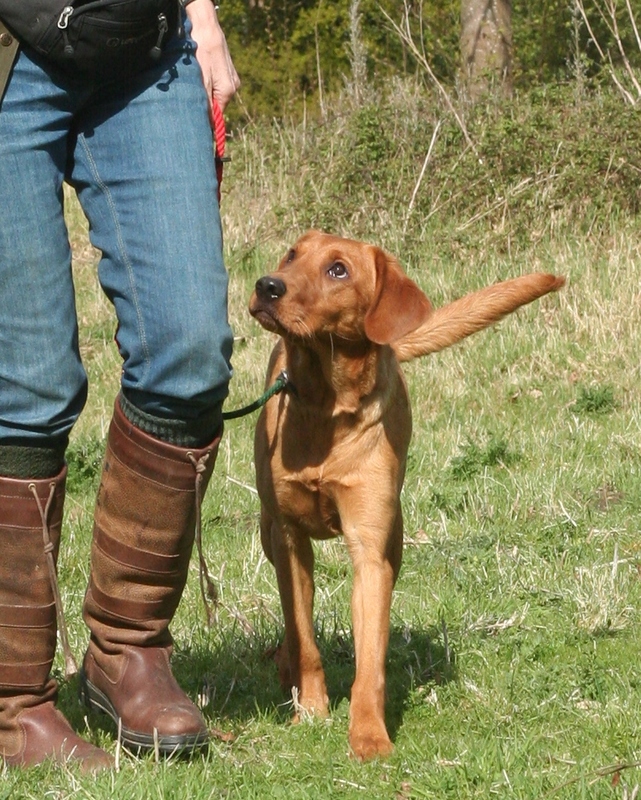 whistle sit at heel – Totally Gundogs <Liked it! Hello, I’m on my first week of whistle training our GSP Seth but we’re only on recall training with 2 peeps of the whistle indoors, recalling him when ever he’s in a different room, it’s going quite well 4 days in, when should I take his training outdoors and should I introduce the 1 peep for stop/sit yet or just concentrate on the recall for now? Hi Pippa, he’s 17 month so were a bit late with his training, he’s only a family pet, I’m currently 2 weeks into Grade 1 gun dog training at Wakefield and was told I need to really get on top of his recall and was advised to start with the whistle. I’ll take a look at the training recall centre, thanks. I won’t be using him in the field but defiantly want to go as far as I can with his training, is 2 peeps a bad idea for his recall, should I change it as I’m only 4 days in? Hi Scott, if you intend to teach him to quarter, it might be an idea to add a couple of pips to the recall. Check with your instructor and see what she thinks. Good luck with your training. I do have a quick question. The advice on running with the dog, whistling, having her stop/sit and running back past her has led her to recalling (from distance) to the point at which I blew the whistle and then sitting there as I walk on until I call her to me. I haven’t quite managed to work out how to reward her at distance – she needs to come to me to get the treat? This could of course be down to the fact that she does not yet retrieve reliably. Any thoughts? Also a small point but the link at the bottom of the Stop Whistle 1 page links to itself rather than Stop Whistle 2 making it a little hard to follow all of the lessons. I also have a nearly two year old sprocker who is doing well with training but the stop whistle is a nightmare! She stops, looks at us and immediately creeps over with her body slung low (as if she knows its wrong) a long way forward almost completely to our feet then lies down. Its rare she will stop and sit (in fact she never sits she lies down is this ok?) and if she does it once we praise her and think we’ve cracked it, then the next time she will creep again and won’t stop! Its been over a year now of trying to break her bad creeping habit and its gotten so frustrating we almost don’t bother with the stop whistle anymore. My Labrador of 7 months got it straight away!! I only had to show him what the whistle meant and he’s pretty much cracked it, on the odd occasion he will stop and stand so I have to put my hand up and shout sit but otherwise he’s good at it! Why is it so hard to break her bad habits? Hi Alex, dogs do what they do because it has somehow been reinforced with something they find rewarding. Creeping towards the handler is often triggered by anxiety. Dogs that do this want to please, but have not grasped what is required. They creep towards the handler because they want reassurance. If the handler responds by scolding or reprimanding the dog, the anxiety and the creeping intensifies. It is a bit of a vicious circle. It sounds as though the stop whistle is not a positive thing at all for your dog. Try working through the exercises in this series, using lots of rewards and no aversives and let me know how you get on. I am filming (if it stops raining 🙂 ) a variety of stop whistle exercises at the moment, and I’ll put links up to these when they are available. I have a two year old working cocker given to me by a gun dog trainer. The stop whistle is my weakest bit. He tends to look at me and creep forward. Should I introduce food training to get him to stop rapidly, or persevere with his favourite tennis ball. How long have you had the dog, and is he sitting and then creeping, or running on a few steps after the whistle is blown and then sitting. I am new to owning/training dogs. I came across your page and decided your method of whistle training was best suited to my 2 5yr old Springer Spaniels. They are from working stock, but I have them as pets only. I have also found a marked improvement in their overall obedience at home. Invaluable advice and it was free!!! Thankyou very much. I have been reading about your whistle training with great interest. Your explanations are clear and precise and easy to follow. My background is competitive obedience but have always been interested in working dogs to the whistle. I have recently started doing some work with a little cocker spaniel and although the little dog is just a pet, we have started some very basic work with the whistle, so it is very helpful to read about how to do things properly. Thank you for sharing your knowledge.